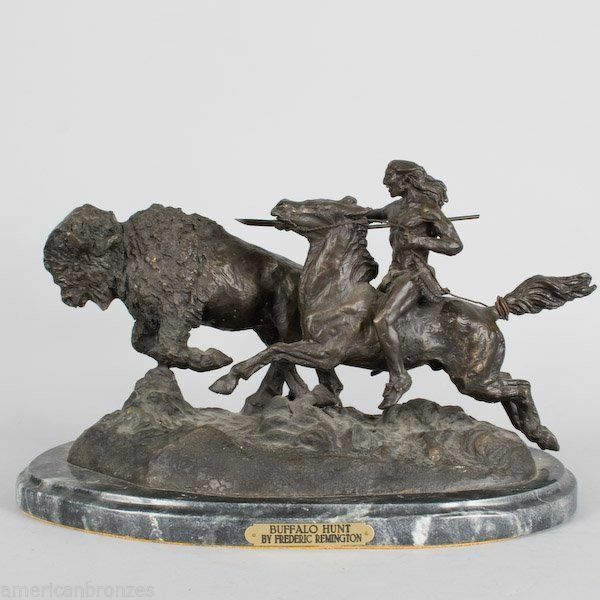 Home » American Bronzes by Artistic Solutions' booth » Buffalo Hunt Collectible Solid Bronze Sculpture Statue By F. Remington Large FS! Buffalo Hunt Collectible Solid Bronze Sculpture Statue By F. Remington Large FS! Buffalo Hunt Collectible Solid Bronze Sculpture Statue Inspired By Frederic Remington Large Size Shipping included to the continental US only. All others please contact us. This statue is reproduced in solid bronze by the "Lost Wax" process, cast in a brown patina and then hand-rubbed to bring out the awesome details and highlights. The statue is then mounted on a marble base with an etched brass plate. Size: 20"H x 30"L. All dimensions are approximate Important Notice: When you’re shopping and comparing bronze statues on eBay and elsewhere, remember to not only compare size and price, but also quality and origin… Many bronzes listed online are Asian bronzes which cannot be compared to American bronzes for many reasons, including quality and authenticity, e.g. : In the United States we have a minimum standard for bronze of at least 90 percent copper. Most imported bronze sculptures are 55% copper or less, for more info click on: American vs Asian Bronzes you won’t find better! Shipping policy: Most item(s) will be shipped out the same day if payment is in our PayPal account before noon, EST, or next business day after the payment is cleared unless otherwise specified. Buyers are responsible for keeping their shipping address current on their PayPal and eBay accounts. We are not responsible for any problem caused by wrong or undeliverable addresses. Buyers pay the extra shipping costs due to wrong or undeliverable addresses including the carrier's charge for return and our cost to reship the order. About combined shipping discounts: Since our products are prepackaged prior to shipping and are in most cases limited to the USPS First Class Mail weight and size limits, we CANNOT offer a combined shipping discount for multiple different auctions. We primarily use USPS First Class Mail and UPS or FEDEX for larger items to save the customer shipping fees and to decrease delivery times. Some of our auctions that allow for more than one quantity of a particular product, selectable within its auction page, will have a combined shipping discount automatically applied to the invoice at the point at which you pay via PayPal. These particular circumstances sometimes do require that the product(s) be shipped by USPS Parcel Post or USPS Priority mail at our discretion. Thanks for your understanding of these packaging and shipping limitations. There is an extra charge for APO, FPO, Alaska, Hawaii and Puerto Rico addresses. Please contact us for shipping cost before purchase. Please note: We only ship to the specified countries checked on our listing or on the eBay list. Sorry, we cannot ship fountains, statues or freight items to AK, HI, PR, APO or PO Boxes or to any addresses outside the lower 48 states. Returns Policy: We want you to be completely satisfied with your purchase. If you find that you need to return an item, please review the complete details of our Return Policy below to determine if any special return conditions apply: Most items may be returned within 30 days after the ship date for a refund. If you would like to replace the item you have returned, please place a new order. While most items are returnable, they are subject to the following guidelines: Customer must inspect all merchandise upon receipt and notify us within 24 hours if anything is missing or damaged. UPS, USPS and FEDEX must also be notified within 24 hours of any shipping damage or no recovery can be made. Returns accepted within 30 days for most items unless otherwise specified, ONLY if all original packaging is saved and used for re-packing the product including all accessories and documentation that shipped with the product. Returns must be packaged appropriately to avoid damage during transit including all accessories and documentation that shipped with the product and returned to the address shown on packing slip unless otherwise specified. Buyer is responsible for original return shipping and associated costs unless item is damaged or different than what was ordered. All Item(s) must be returned unused and in its original condition. Credit for a return can only take place after a product has arrived in our facility. Upon receipt, a 25% restocking fee will apply to all returned items that were not damaged, or not sent in error. The handling fee is assessed to help defray the costs associated with receipt, processing, inspection, repackaging, and paperwork processing to provide the credit and reenter into the inventory system. Our approval e-mail must accompany the return in order to assure proper handling and credit. We decline any responsibility for any damage or loss that may occur during the return, so please be sure to insure the items. If product arrives to you with a defect or damage, we will replace the item or refund your entire payment less the original shipping and handling fee listed or the shipping fee we paid for an item offered with free shipping. “As is” and made to order merchandise is not returnable. Please contact us for a Return Material Authorization (RMA) number prior to any return. Returns will not be accepted without prior authorization. Return Shipping Costs: If you refuse your delivery without inspection, miss your delivery appointment(s) or return a non-defective or undamaged product, you will incur original shipping charges along with actual return shipping plus the aforementioned restocking fees. Disclaimer: Our digital images are as accurate as possible. However, different monitors different lighting may cause colors to vary slightly. Some of our items are handcrafted and/or hand finished. Color can vary and slight imperfections are normal as the hand finishing process adds character and authenticity to those items. Marble base color may differ from photo. All dimensions are approximate.